You’ve worked hard to design your study well. Now make the most of it. PERMANOVA+ gives you all the advantages of classical linear models, but leaves the assumptions behind. 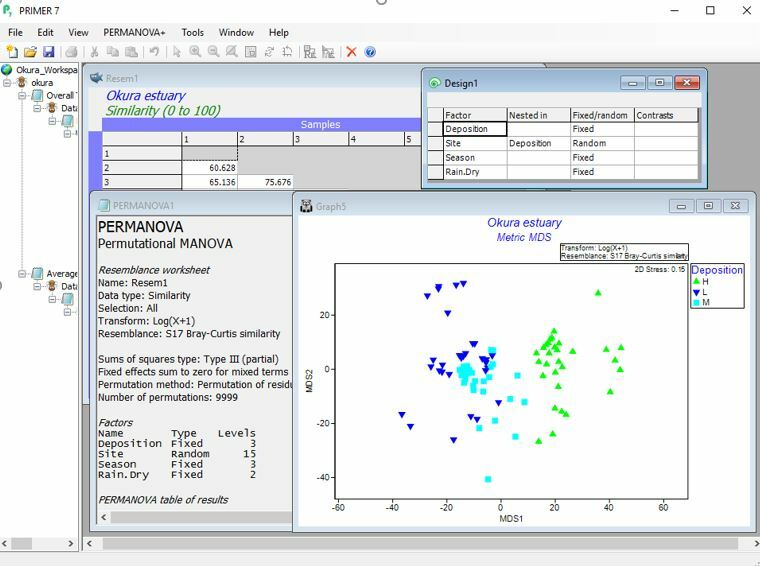 PERMANOVA+ is an add-on package for PRIMER v7 that extends resemblance-based methods to allow the analysis of multivariate (or univariate) data in response to multi-factorial sampling designs, complex experiments and/or gradients. The data cloud is modelled directly in the space of the chosen resemblance measure, retaining fundamental flexibility. Formal inferences are achieved through accurate construction of relevant test-statistics and sophisticated permutational algorithms, making it distribution-free. All you have to do is know your design; PERMANOVA+ does all of the hard stuff for you. PERMANOVA partitions variation in multivariate dissimilarity spaces to test hypotheses for complex designs – including fixed or random factors, interactions, and hierarchical (nested) structures and/or covariates. Model multivariate data in response to environmental (or other) continuous variables with distance-based redundancy analysis (dbRDA). Use information criteria and sequential conditional permutation tests to explore relationships, perform model selection and achieve parsimony. Perform resemblance-based discriminant analysis via canonical analysis of principal coordinates (CAP), with cross-validation. 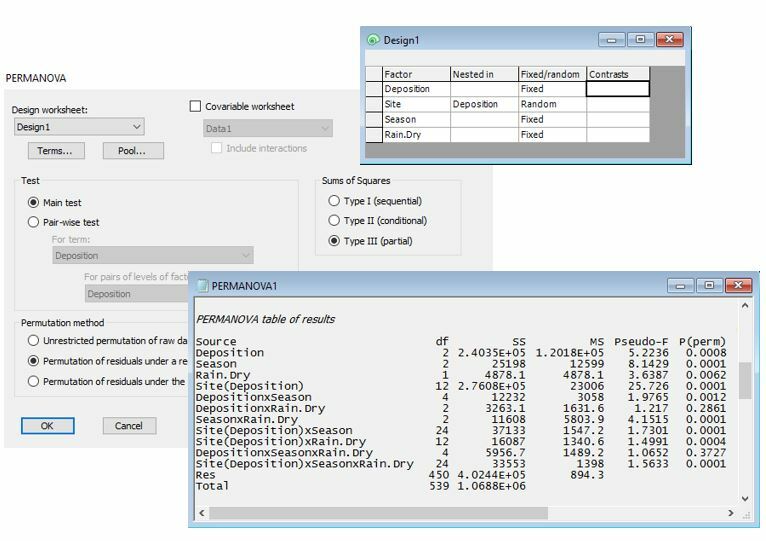 Allocate new samples to existing groups, or predict positions of new samples along continuous gradients. Multi-factorial ANOVA, ANCOVA designs or multiple regression models for multi-response data. Base your analysis on a resemblance measure, or choose Euclidean distance to obtain classical results. Test-statistics are calculated using scrupulous attention to the details of your design and logic. All p-values obtained by advanced permutation techniques for powerful, rigorous, distribution-free results you can trust. Seamless integration within the PRIMER v7 Windows environment. Sophisticated methods for multivariate analysis right alongside all of the data-handling and visualisation tools in PRIMER that you already love. Don’t let all those factors and dimensions get you down. Put PERMANOVA to work. Achieve a comprehensive and careful analysis of your multivariate data, with all the trimmings. Direct partitioning of multivariate data, based on a resemblance matrix of choice. Multi-factorial designs, interactions, fixed or random factors, nested or crossed, asymmetrical. Automatically identifies all terms implicit in a given design, with the ability to pool or remove terms. Test-statistics constructed based on expectations of mean squares (EMS). Permutation algorithms allow multi-level designs and account for other terms in the model. Pairwise comparisons and user-specified contrasts. Estimation of effect sizes / variance components. Distances among centroids reveal salient patterns in factorial structures. Unbalanced or unreplicated designs (split plots, randomized blocks, etc. ); choose the Type of SS. Test the homogeneity of within-group multivariate dispersions on the basis of any resemblance measure. The perfect complement to PERMANOVA, PERMDISP focuses on variability – how “spread out” the points are – in different groups. Excellent for studies of ecological beta diversity in natural systems or studies of genetic variation. Find out how much variation in the multivariate data cloud is explained by one or more explanatory variables. Visualise fitted values with dissimilarity-based redundancy analysis (dbRDA) ordination. Perform discriminant analysis in the space of a chosen resemblance measure using canonical analysis of principal coordinates (CAP). Leave-one-out cross-validation gives a statistical measure of the distinctiveness of a priori groups. Allocate new samples to existing groups, or predict the positions of new samples along continuous gradients. 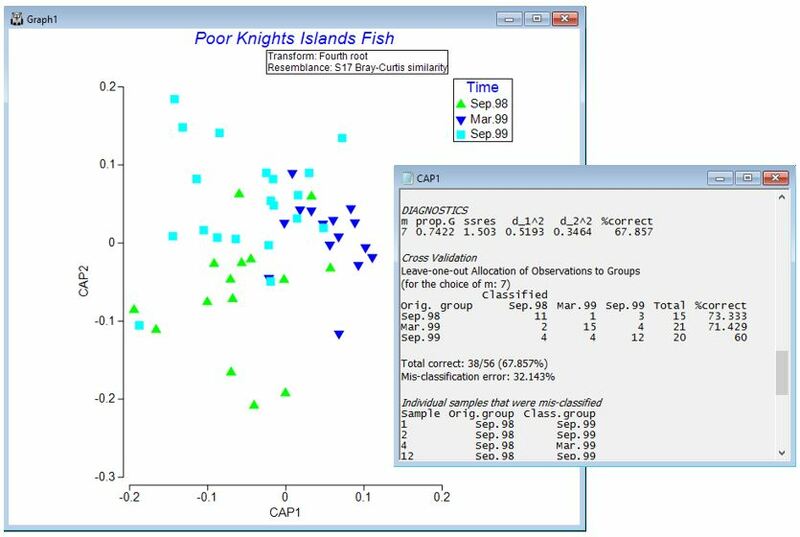 Excellent for environmental monitoring programs, morphological analyses of characters, or validation of clustering outcomes with new data. Explore inter-relationships between two sets of variables in Euclidean space or via a dissimilarity measure using a canonical correlation approach. We respect your privacy and won’t share your information with third parties. Read our terms here.